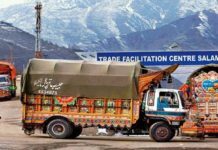 New Delhi: In the wake of escalating tension between te nuclear-armed neighbours, Pakistan on Tuesday asserted that the country doesn’t want to go to war but wants peace. 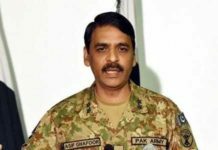 Pakistani military spokesperson Major General Asif Ghafoor appealed the Indian government for dialogue so that peace is restored between them. “If you want peace then let us talk. No issue can be resolved through war. India should think about this offer with a cool mind,” Ghafoor was quoted as saying by PTI. “Pakistan does not want to go for war, our message is peace. The international community should also play it role,” the spokesman said. “What we did today is in self-defence. We do not want to celebrate it, as war is a victory of none as only humanity loses in war,” he said. Ghafoor also added that war is also a failure of policy. Earlier in the day, three Pakistani Air Force jets violated the Indian air space and crossed the Line of Control (LoC) to enter Jammu and Kashmir. According to senior officials, the jets entered Poonch and Nowshera sectors but were pushed back by Indian Air Force aircraft patrolling the area. The Pakistani jets also dropped bombs before fleeing; however, there were no reports of any casualty or damage of properties, Indian officials told PTI. In the meantime, nine airports, including the ones in Srinagar and Jammu, were shut down by the administration for civilian air traffic amid escalating tension with Pakistan, officials said. Airports at Srinagar, Jammu, Leh, Pathankot, Amritsar, Shimla, Kangra, Kullu Manali, Pithoragarh were among those closed, they said. While the official did not specify the nature of the emergency, it is believed the step was taken in view of an IAF jet crashing in Budgam district this morning. Airports at Chandigarh, Pathankot, Halwara are Bathinda have been put on high alert. Punjab’s six border districts of Fazilka, Ferozepur, Tarn Taran, Gurdaspur, Pathankot and Amritsar are on high alert since Tuesday. Deputy Commissioners and SSPs of border areas have been asked to put in place all contingency plans to ensure protection and safety of citizens, officials said. Earlier in the day, Union Home Minister Rajnath Singh reviewed the security situation in the country, especially along the border with Pakistan. During the meeting, attended by National Security Advisor Ajit Doval among others, a detailed presentation was given about the security situation in the country and steps taken to ensure peace in all sensitive places. The pre-dawn operation described as ‘non-military’ and ‘preemptive’ struck a five-star resort-style camp on a hilltop forest that provided a dozen Mirage 2000 fighter jets of the Indian Air Force(IAF) with a “sitting duck target” and caught the terrorists in their sleep, sources said. The strike is the first by the IAF inside Pakistan after the 1971 war.